The idea that film and music go hand in hand is hardly a new concept. But the idea of film as music does offer a new twist - one that multi-talented artist Mike Relm has been perfecting. A former winner of the International Turntablist Federation's US competition, Relm has become known for live shows presenting audio mixes paired with video images that he "scratches" in real time. If you've ever thought Office Space's famous "O Face" scene might make one hell of a song, this just might be for you. 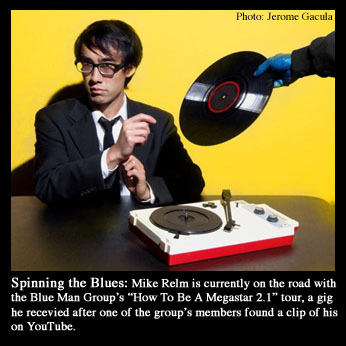 Currently on the road with Blue Man Group, Relm has been quickly gaining a following outside the electronic community, a fanbase that is likely to grow even further when he releases innovative new DVD, Clown Alley, on April 1. Rock Star Journalism: What was the first film that inspired you? Do you ever plan on pursuing film in a more direct manner? Mike Relm: I saw Tim Burton's Batman when I was 11 or 12. It was the first time I felt aware that there was a creative process that went into films. I mean, I had seen some documentaries on the making of Star Wars, but there was something about Batman that made me think, "This is what I want to be doing." And I'm not talkin about fighting crime in a rubber suit. A more direct approach? I'm looking forward to it. RSJ: Do you consider what you do to be performance art? MR: I've never really thought of it as performance art, but I suppose it is. Well, technically, anything someone does for an audience is performance art. I'm still trying to figure out what to call the thing I do. 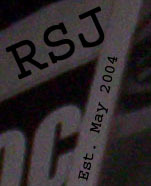 RSJ: The inclusion of your very own set of Mike Relm glasses with the new DVD is fantastic. How did you come up with the idea for the 3D elements? MR: Thanks! I have a tendency to ask a lot of an audience. My live show is not just a mindless mix of songs and swirly visuals; some of the bits I do require skills like reading, which I know can be tough depending on your state of mind. When it came to making Clown Alley, I wanted to make sure it was something that you can't just pop in while you're doing the dishes. My goal was to do something that hasn't been done in awhile, and I kept going back to campy 3D action films. For some reason I remember seeing monster movies in 3D but I can't find any of them today. It's such a cool effect that doesn't require a huge production company, which worked out great for me because I did most of editing and effects myself. RSJ: Could you give us a rundown of your set-up? What programs do you use? MR: Right now I'm using two turntables, two mixers, and a DVJ, which is basically a DVD turntable. I don't use programs for my visuals, but I do use Scratch Live for my audio tracks. Nothing fancy, it's time for an upgrade! RSJ: It has been reported online that YouTube caused you to get the spot on the Blue Man tour, when one of the members saw a clip. Is this true? MR: That's the truth. It's great for me because I didn't have to go through auditions or bug them with demos. It does say a lot about them though, because my videos weren't exactly in high circulation. I think at the time I was at a few thousand views at the most, so it wasn't like I was on the YouTube homepage or anything. They had to do some research to find me! When I met them I found that they have great taste in music and art. They still keep up with the independent music scene, which I honestly didn't expect from a household name. RSJ: How did you prepare for the different audiences that would attend these shows? MR: I basically took the pieces of my set that I thought worked best for mainstream audiences. It was tougher than I thought because most of my material is geared for smaller crowds who have almost exactly the same taste in music and films that I do. Mostly I looked at how stand-up comedians do "clean" versions of their acts. Of course they switch out the bad words and references, but the good ones figure out how to get the exact same reaction as they do in their uncensored performances. I just applied their philosophies to what I do and it worked out great. RSJ: With such an eclectic variety of music and movies in your sets, what do you think gets you over with the crowds that aren't already familiar with what you're doing? MR: It's funny, I feel like most of the crowds on this tour have been with me from the get go. A lot of it is the fact that when you go to a Blue Man show, you're bringing an open mind. I'm also not a very self-indulgent guy on stage. I don't come out yelling, trying to get them to respond to me because most of them have no idea who I am. And if I were them, I wouldn't give it up so easily either. But by the time I get bits in, we're all screaming and having a good time. RSJ: Previously, you have performed at Coachella and other such events; however, on this tour you are playing largely arenas. Do you prefer to play the big outdoor festivals over the indoor venues? MR: That's a tough one. Indoor venues are great because it's such a controlled environment, no wind or rain or snow to deal with. Plus, you don't have to worry about people wandering off to a different stage like at the festivals. On the other hand, I love the energy of the festivals. When there are so many great artists playing on the same weekend on the same grounds, it really pushes you to step your game up. When I did Coachella I was really fired up because I was opposite of the Red Hot Chili Peppers. That's just crazy knowing that they were less than a mile away doing their thing. RSJ: Having already been immortalized in "Scratch" with DJ Shadow and organized Skratchcon 2000, where do you see yourself going next? MR: It would be great to be able to create live shows that I can tour, then come home and make films and records. I get bored really easily, so it's important for me to do different things constantly. The next immediate thing is to present a whole new live show with new music, visuals, instruments, etc. 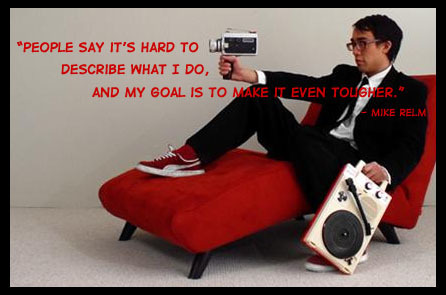 People say it's hard to describe what I do, and my goal is to make it even tougher. RSJ: Since DJing is such an open concept, in what direction do you think the scene could be pushed in the future? MR: DJing is such a huge concept, and I think it's actually too open for its own good. Most people aren't in it to push the art form, and there's nothing wrong with that. It's hard enough to get work, period, if you're a club DJ. I don't really see myself as a part of the "DJing scene," but I did come from it, so it does bum me out when I look at the state of things. Sadly, I believe the scene isn't going to get any bigger. Or maybe I'm just saying that to get some people motivated. Either way, there's room to grow. RSJ: You have never attached DJ to your name; what do you think divides you from DJing since that is the scene you are most associated with? MR: My approach is very different from the scene. I mean, if you took what I do at face value I think you can make the connection between what I do and what DJs do. The thing is, DJs are pretty lazy. You can easily go on stage and play everyone's favorite songs all in a row and get the same reaction as a full band. But then what? Anyone with a decently stocked iPod can do that. I feel like if the audience can do what you do, you don't deserve to be on stage. If everyone could act as good as Will Smith, then we probably wouldn't go out to see Will Smith movies. RSJ: Remember back in the mid 90s when The Prodigy was all the rage and electronica and Djing were poised to be the next big thing? Why do you think it never made it to widespread acceptance and radio airplay? Do you think it ever will? MR: Oh yes, those were the days. If you ask 10 people, you'll get 10 reasons why DJing never became bigger than it did. Around the time when it did peak, there was this whole image that a DJ could replace a band or singer. Now, musically perhaps it might have been true, in certain respects. But when it comes to a live show, there's just no way a guy playing records with his head down makes for a compelling performance. The music itself didn't really go past the dance/rave world. Like, with hip hop there are songs that transcended the genre and crossed over to soul or R&B or rock. A good number of rock lovers can name at least a few Outkast songs, but I have never met someone who isn't deep into dance music that can name a Paul Oakenfold track, even though he's huge in that scene. On the other hand, you have guys like Daft Punk who have an amazing live show and also produce songs that get heavy radio play. I guess in the end what it comes down to is presentation. Daft Punk's hit songs are structured in a way that is a lot easier to digest than the 10-minute break beat tracks that a lot of their peers produce. Fatboy Slim also has had numerous songs that got a lot of play, and I think with him it's also a case of presenting the right songs in the right way. Some people still think "Rockafella Skank" was made by a band. RSJ: What kind of vinyl collection do you have? Do you collect any vinyl for it's monetary value at all? MR: I never really collected records for their monetary value. To me it was always just about what sounds were on the records and what I could do with them, because I was going to scratch the hell out of them anyway. I never had a lot of extra money to spend so whatever wax I bought I used. RSJ: When will the new website be up? MR: The new site will be up in early April; MySpace or imeem is good for now. Got something to say about this feature? Post it at RSJ's blog, Blendetta.com!